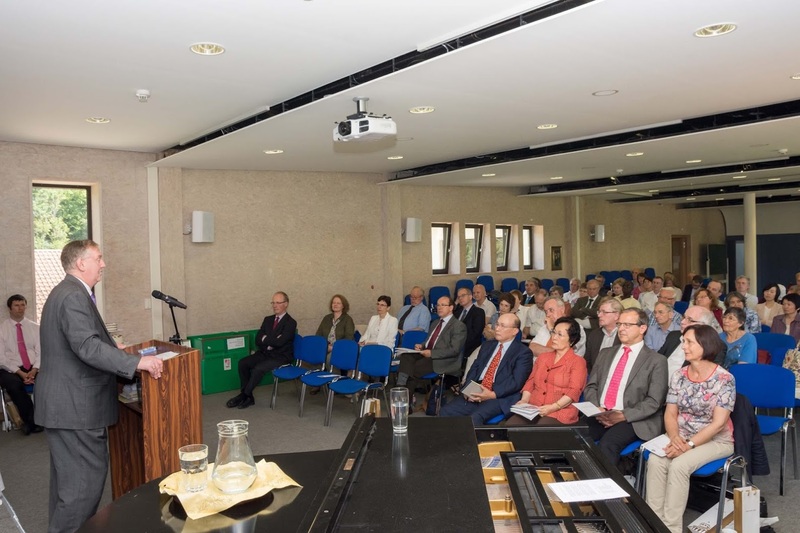 FFWPU Europe, By Fritz Piepenburg, Neumühle, Bad Camberg, June 29, 2015: Church leaders from all over Europe together with members of the Frankfurt, Giessen and Dusseldorf community participated the farewell ceremony for our continental director Rev. 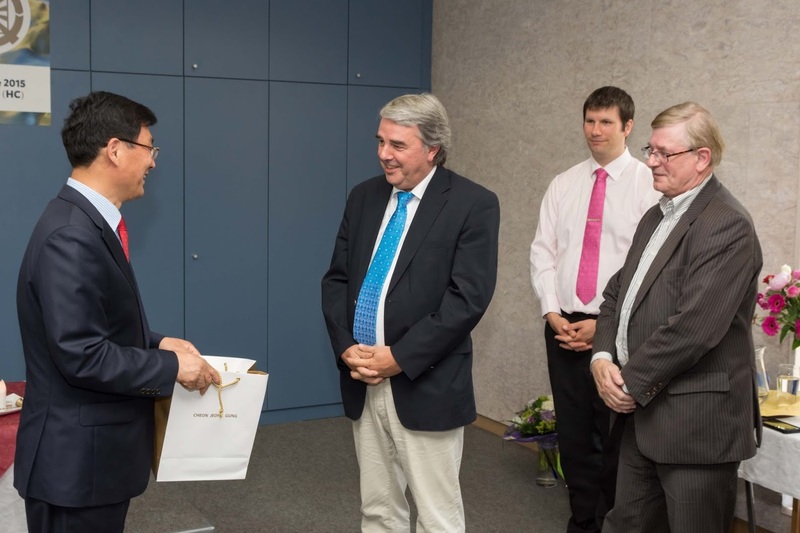 Young Sik An, followed by the welcoming of the new continental director of Europe Rev. Jack Corely. The event took place on Monday, June 29th at the Seminar House Neumuehle. In his opening remarks, Matthew Huish, the newly appointed national leader of the United Kingdom, pointed out that a new era has begun for Europe. For the first time after 36 years of Korean leadership, True Mother appointed an European to the position of Continental Director of Europe. Thus, after celebrating the first 50 years of European movement in Vienna together with True Mother and the World President Sun Jin Nim, Europe starts its second 50-year period with a different look. After singing the national anthem, Karl- Christian Hausmann led everybody in prayer and bow to begin the memorable event. Rainer Fuchs read Mother’s speech in Vienna for Hoon Dok Hae. Dear Rev. & Mrs. An, on behalf of WFWP-Europe, together with the FFWPU Switzerland (who have good working relationships, as you know), we want to thank you for your untiring investment and concern for the Providential work in Europe. More than you may know, your thoughtful, clear explanations of Providential Developments and unconditional trust during the time of True Mother’s early leadership have been very reassuring for our European family and protected us from some of the turbulences felt in other regions. Our sisters (and brothers) have felt personally encouraged by you over and over as we try to live up to our True Parents expectations. Similarly, your careful attentiveness to concerns of our youth, while trusting the existing leadership, have surely helped to avert a more serious crisis. We have felt this from the very beginning of your mission, that you were the right person sent at the right time to the right place! We thank our Heavenly Parent for the privilege of having been able to work with you for this short but intense time period. We are sad by your departure, but also happy for you being able to fulfil a new and challenging mission with the International World Mission Department in Korea. We hope that you will go on to your new mission knowing that you have filled a very critical role in Europe’s history- and knowing our sincere gratitude. We wish for you many opportunities to support and protect our True Parents directly – and the deepest joy and satisfaction in your lives. “Time is really flying. In less than two and half year you started your mission as the continental leader for Europe. I can vividly remember when we had your inauguration in London. In my welcome remarks I expressed: What a wonderful occasion for you Rev. An to start your new mission at the beginning of Chon Il Guk. We want to build with you, Rev. An a Cheon Il Guk community, a community where we want to support the individual abilities and talents of our young brothers and sisters. They long for a church community where they can participate in the decision making process and where they can share free and open about the Divine Principle, as well about our cultural backgrounds and differences. This desire reflects the European spirit of self-determination and the ideal of responsible citizens in the realm of Cheon Il Guk. You were our first continental leader in the Cheon Il Guk era and you fulfilled our expectations, mentioned at this welcoming speech. I remember our first leaders meeting in Schmitten. We had no clear schedule but we came together and shared openly from heart to heart and in this way created a beautiful loving atmosphere together. How many times we talked for a long time over skype and it did not matter what time it was. It always felt easy to contact you. Your leadership in Europe was refreshing. You took the humble way and preferred a low-key appearance. You had no personal ambition or wanted to look good in front of True Parents. I never forget how you supported the issue of Camberg all the way to True Mother, who finally supported our seminar centre with a big donation. At that time we had no finances any more to continue the restoration. Thank you very much again. The Neumühle, Camberg became your home and I am sure there will be times in the future you will miss it. However, my wife and I felt often bad that we could not take better care of you here. Many times you had to prepare your own meal using a very old rice cooker. But you never complained. Your presence here made it easy to meet brothers and sisters and you supported so many workshops. You brought back the European headquarter to Germany. Your most urgent task when you were here was to heal a kind of disunity in our European movement. The way you dealt with it was setting the course for the future. You took time, you listened, you visited and you could start to restore the lost trust of many and especially among second generation in the leaders. You taught us a lot about the Eastern wisdom. One of your very profound guidance was: Sometimes it is better not to do something than doing something. Your concern was to establish a member-oriented movement. You slimed down the costs for the European office. How many times you went by yourself in the car so you would not be a burden to anyone. You encouraged brothers and sisters and praised them. You took away the pressure and one could feel at ease in your presence. However the most important precious point you taught us and lived by example was your vertical connection to True Parents. I really felt you were always looking for God´s viewpoint rather than pushing your own idea in the front. It is this quality what made it easy for most of us to unite with you. I am deeply touched by this decision of True Mother to appoint you as vice president of the international FFWPU. Among Korean Elders you are quite unknown but True Mother can see the inner qualities of your leadership and gave you this most trusted responsibility. At the same time TM must trust the European movement that we can go on without you from now and appoints for the first time a European as the continental director. Rev. An, we wish you for your new mission all the strength needed. We are sure that your love for True Parents as well for the brothers and sisters, your faith in Heavenly Parent and your wisdom will guide you successfully in your new task. If there should be a nickname given to you at the end of your European mission it could be the “wise one”. We say good bye to you but also to your wife Mi-jung Cho. Although she could not spent much time with us in Europe, we have only pleasant memories of her. Naturally we felt close to her and wanted to be around her. We will never forget her smiles and her serving attitude for brothers and sisters. Please give our love and greetings to her. We already miss you both now. You have a deep place in the heart of the German brothers and sisters and all community leaders, which now will be very close to True Mother. In this way we all from Europe will be more close to the True Parents. Respected Rev. An and Rev. Jack Corley and beloved European leaders, Good morning! We are gathered here today to hold the ‘Farewell and Inauguration Ceremony of the European Continental Director’, in accordance with the announcement of personnel changes made by True Parents. Rev. An, congratulation for your promotion! Through this change, True Parents asked Rev. Young Shik An move to the position of the Vice President of International Headquarters in Korea. Dr. Moon and I want to offer our warm heart congratulation and gratitude to Rev. An for his hard works as the Continental Director in Europe. I hope you can fulfill your new mission successfully with full support of all European members. At the same time, we also offer our congratulations and encouragement to Rev. Jack Corley, who has been newly appointed as the European Continental Director and has taken such a great responsibility. Rev. Jack Corley, congratulation for your new mission. 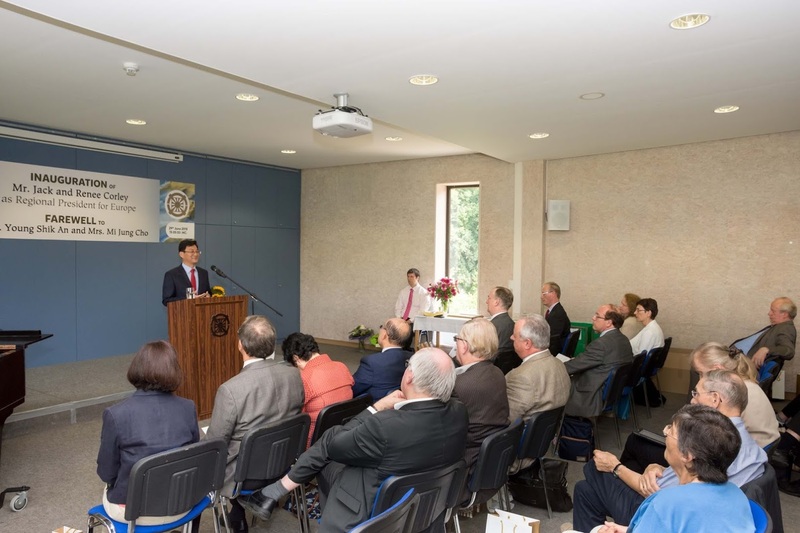 Last May 10th, we successfully held the ‘Commemorative Celebrations for the Fiftieth Anniversary of Mission Work in Europe’ under the guidance of True Parents. Still I can feel the excitement of that celebration, and my heart still beat overflowing with the blessings and grace we have received on that day. I am sure that all blessed couples and members in Europe returned home on that day with deeply touched hearts, and that they are making every effort to prepare for the next fifty years with a new resolution. After True Mother arrived in the United States after European tour, she continued to speak of how impressed she was on her European tour, and what great expectations she had come to have for the European second generations. In her European tour, True Parents comforted all European members for their sacrifices and devotions in last 50 years but on the other hand she strongly emphasized in her message to make new Europe. And True Parents showed us personally how this change should be made. As a first step she changed the leadership structure of the European Continent unexpectedly. This is indeed a great change. It means that from now on True Parents are going to entrust the Providence in Europe to European leaders. This change in leadership in Europe is the first step for creating a new Europe. Until now, Europe has for a long time been in the realm of indirect dominion through Korean leaders, but now that a European leader has been appointed as the highest commander in the realm of the direct dominion of True Parents. Rev. Jack Corley! Under yours leadership you have to make new strategies and achieve more results than before. Now you can dedicate your achievements to True Parents directly. However, this is not something that can be achieved through the sole efforts of the newly appointed Continental Director himself. Rather, all European leaders gathered here should clearly understand and uphold the messages that True Mother has given to us on her visit, and pool our efforts together and do our utmost best to complete transforming to new Europe. Last 23rd of June, one day before our departure to Europe, True Mother asked Dr. Moon and me to come to Cheonjeonggung. We had very good private meeting with True Mother for a while. At that time she especially explained to us her idea to make personnel change suddenly this time. And she asked us, as Special Emissaries to work closely with new Regional President and all European leaders to change the spirit of European members and to make Europe move forward. She said that European blessed families and members had celebrated 50 years anniversary with me. As True Parents have recognized European history as a successful one, from now on European members have to create another 50 years victorious history. Through this opportunity I convey to you our beloved True Mother’s desire and hope to European members and new leaders. Beloved leaders of Europe, now that True Mother has established a new central figure for us, let us pool our energies together centering on him and do our very best so that the European continent can fulfill the expectations of True Parents. Rev. 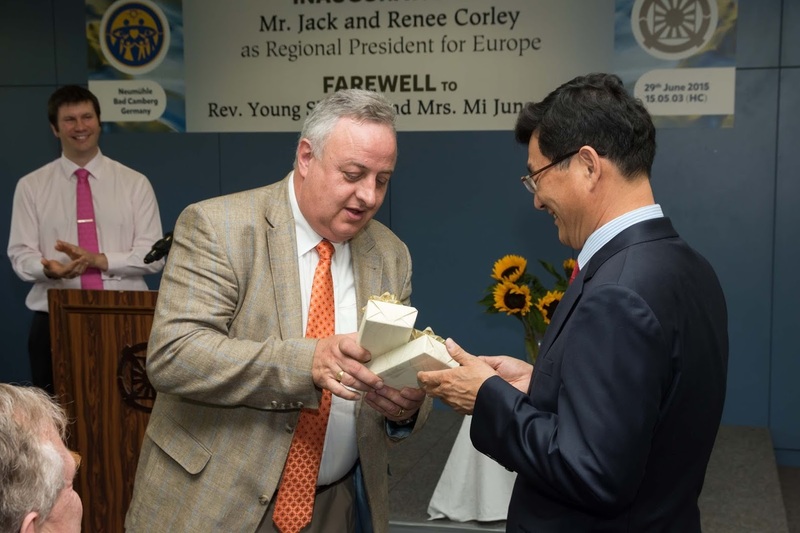 Young Shik An and Mrs. Mi Jung Cho in sincere gratitude for your service to the providence in Europe. From your assignment on March 1st 2013, by True Parents as an Itinerary Worker in Europe to your further appointment on January 31st 2014, as European Director, you have selflessly served this region through sharing your wisdom and deep insights. The successful visit of True Mother and Sun Jin Nim to Europe in May 2015 is a lasting testament to your guidance and leadership. More acknowledgements and gifts came from Switzerland, Germany, the Czech Republic and the communities of Frankfurt and Dusseldorf. Rev. An in his farewell address stressed the importance of having a goal and following it through no matter what. He gave the example of American slaves who escaped from the southern states and walked north to freedom at night, only guided by the polestar. Peter and Margaret Staudinger made the flower presentation, followed by a musical offering by Margaret and Hans Campmann. A beautifully arranged cake was cut in honor or the outgoing and incoming continental directors. After a brief intercession, Rev. Jack Corely was welcomed as the new director for Europe. He related his surprise when he heard the news about his appointment by a telephone call from Rev. An. After a musical offering by Heide Wakayama and her son Takanori, Dr. Lan-young Moon gave the benediction prayer and Heiner Handschin led everyone in a final threefold cheer of Mansai! After another break, Rev. Corley gathered the participants and listened to their worries and suggestions for the sake of future Europe. Rev. No-hi Pak took on the final word and stressed True Mother’s understanding that the Family Federation always was and will be a religious organization based on faith and belief.